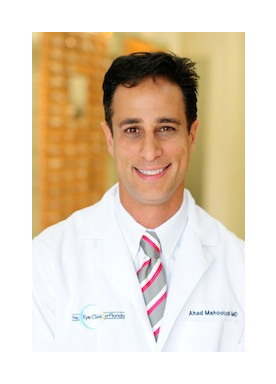 Dr. Mahootchi is a board certified Ophthalmologist and the Medical Director of the Clinic. A Tampa Tribune reader’s poll has ranked him as Pasco’s Best Eye Surgeon for the last 4 years. PatientsChoice.org has recognized him as a top 10 rated doctor in Florida. He won the Patient’s Choice again this year for the 6th year in a row. The award is given to less than 3% of doctors and based on patient voting. Dr. Mahootchi was born in Carbondale, Illinois and grew up in Tennessee. He attended Vanderbilt University School of Medicine in Nashville. His Internship in Internal Medicine and Residency in Ophthalmology were also at Vanderbilt. Dr. Mahootchi had the highest academic scholarships to both college and medical school. He is board certified by the American Board of Ophthalmology and participates in the Maintenance of Certification program every 10 years. Dr. Mahootchi began practice in Zephyrhills in 1997. He has performed over 12,000 eye surgeries. Thousands locally have trusted him with their eye care. Dr. Mahootchi is one of the most experienced cataract eye surgeons in the country with lens implants that correct astigmatism. He was Zephyrhills’ first certified Crystalens eye surgeon and is the most experienced ophthalmologist who performs LASIK and CK in the area. Dr. Mahootchi is one of the most experienced eye doctors in the country with Trulign. Trulign is the astigmatism correcting version of Crystalens. He also treats patients with dry eyes, tearing eyes, corneal problems, glaucoma, diabetic retinopathy, and macular degeneration. He performed central Florida’s first DMEK surgery that transplants a single layer of cells to clear the cornea. He also performs eyelid surgery for cosmetic and functional problems. Dr. Mahootchi has a special interest in treating and preventing vision loss for those with diabetes, macular degeneration and glaucoma. Contact The Eye Clinic of Florida for a Free Vision or Cataract Screening today.